J’ai reçu les deux livres photographiés ci-contre ce matin. Je ne sais pas trop quand je vais avoir le temps de les lire étant donné que je vais être très occupée ces prochains jours à préparer un dossier administratif, mais je suis ravie de les avoir et pour celui de Marija Gimbutas de l’avoir en version « papier », plus pratique à (re)lire à la maison que la version pdf (sur laquelle de toutes façons je n’arrive pas à remettre la main). Bringing together archaeological evidence, comparative mythology and folklore, and symbolic interpretations, Gimbutas’s work asserts the existence in prehistoric Europe of a widespread culture centered on the Goddess, lifegiver and sustainer, as well as death-wielder. Through the examination of hundreds of Paleolithic and mostly Neolithic pieces, the author traces cross-cultural and cross-chronological symbolic parallels, some of which are quite broad and open to several types of inference. The central and venerated position of women in the unconscious of early European people seems probable; this order of things changed with the incursions by Kurgan groups (4300-2800 B.C.) and the European world moved « from matrilineal to patrilineal. » Whether or not one agrees with these archaeomythological interpretations, Gimbutas offers a thought-provoking symbolic reading of hundreds of selected pieces, beautifully reproduced in this sizeable compendium. Winnie Lambrecht, Brown Univ., Providence, R.I.
How can women turn birthday parties, baby showers, and other rites of passage into empowering celebrations brimming with meaning and fiery feminine spirit? 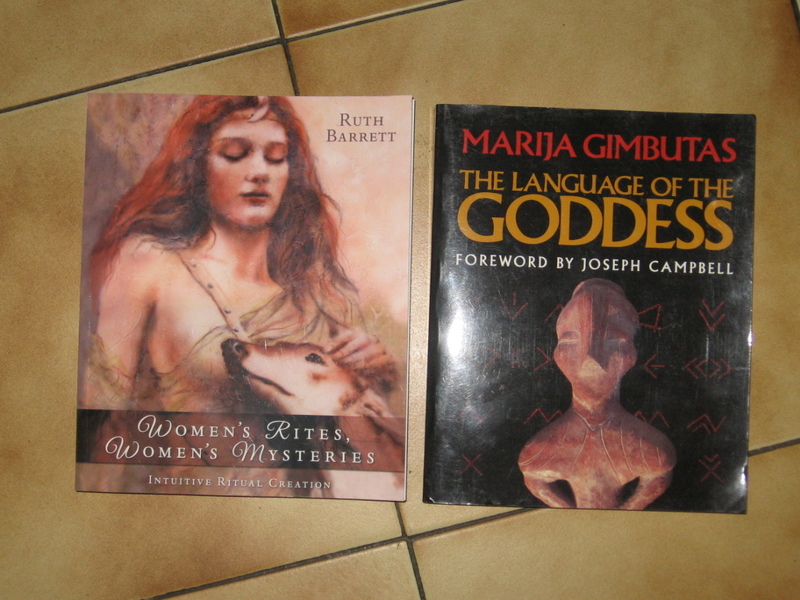 Emphasizing the Dianic Wiccan tradition, Barrett shows women how they can create empowering, transformative rituals that strengthen their profound connection to the Goddess. Instead of providing shortcuts, scripts, or rote rituals, she teaches women how to think like a ritualist. Step by step, readers learn the ritual-making process: developing a purpose and theme, building an altar, preparing emotionally and mentally (energetics), spellcasting, and more. For beginners or experienced ritualists, solitaries or groups, this thorough, engaging guide to the art of ritual-making can help women commemorate every sacred milestone-from menstruation to marriage to menopause-that touches their lives. « Ruth Barrett brings her many years of experience in teaching and priestessing in the Dianic tradition to this book. Her thoughtfulness, intelligence and depth of understanding make it a valuable resource and will open a new perspective for many Pagans. Starhawk, best-selling author of The Spiral Dance and The Fifth Sacred Thing. Cette entrée a été publiée dans Carnet de Lectures et étiqueté livres, Marija Gimbutas, Ruth Barrett . Marquer le permalien . Hein ? Tu as The Language Of The Goddess en version .pdf ?? J’ai lu le Ruth Barrett il m’a bien plus mais c’est très spécifique à une tradition quand même, et frustrant pour une sorcière solitaire comme moi!! @ Taàri : bien noté, si je retrouve le DVD avec mes pdf en faisant les cartons et donc du tri / rangement, je te fais signe. @ Carabosse : oui, oui, j’ai bien noté qu’il était spécifique à la tradition dianique, mais la lecture en sera très certainement intéressante en dépit du fait qu’il ne correspond pas à mon chemin.